In 1971, a group of workers were employed by the hospital at Changsha, the capital of Hunan province in Southern China, to construct a bomb shelter in the side of a hill in the hospital grounds. The workers were busy excavating the shelter when 100 feet into the mound they made a most unexpected discovery. For it turned out the hill was the burial site of three elaborate ancient tombs filled, with extraordinarily well-preserved grave goods that rivalled finds from Ancient Egypt. Experts dated the tombs to the second century BC, the period of the Western Han Dynasty. Within them, they discovered bodies belonged to three members of the ruling dynasty of the Han fiefdom of Dai. The oldest tomb belonged to the Li Cang, the Marquis of Dai. The next tomb, dated to 18 years after the first, contained the remains of a man in his 30’s who is believed to be either the Marquis’s brother or his son, Li Xi. However, grandest of the tombs, dated to the same year as the second, belonged to a woman. She was Xin Zhui, the Lady Dai, wife of the Marquis Li Cang. While Lady Dai’s tomb was equally as her ostentatious as her husband and son’s, it was her corpse that excited the most interest. 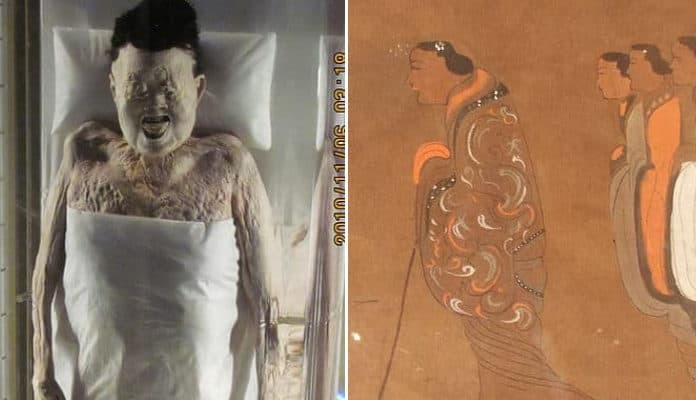 For Xin Zhui’s two-thousand-year-old remains were in the same state of preservation as someone only recently deceased. The extraordinary state of her body led to the media hailing Xin Zhui as the best-preserved mummy in the world. However, Lady Dai may not be a mummy at all. The location of the three tombs. Picture Credit: Siyuwj. Wikimedia Commons. Creative Commons Attribution-Share Alike 4.0 International license. The Chinese Mawangdui Tombs that rivalled those of the Pharaohs. The Mawangdui tombs, as the last resting place of Lady Dai and her relatives, have become known, were burials to rival the ancient Egyptians. The exterior of each tomb consisted of layers of white clay and charcoal, while the builders had lined the interiors with cypress or pine planks. Inside each vault, a series of wooden chambers surrounded the tomb’s occupant who lay inside a nest of coffins. These chambers were stuffed full of the trappings of their occupant’s earthly status, which they intended to take with them into the afterlife. The Lords and lady of Dai certainly intended to enjoy eternity in style. Archaeologists recovered approximately 3000 objects from all three tombs, including works of art, musical instruments, clothes, food and household and personal items- as well as facsimiles of the family’s servants. They recovered few personal effects from the western tomb belonging to Li Cang, the first Marquis of Dai who died in 186 BC because robbers cleared it out in antiquity. The grave of his male relative, Li Xi, fared better. For the extensive library of military, medicinal and astronomical texts written on silk that Li Xi took with him into the afterlife in 168 BC remains intact. Lady Dai’s even more impressive tomb was built shortly after Li Xi’s. The grave goods inside it show the lady was a woman of wealth and importance in her own right. People assisting with the burial had stuffed the four compartments that surrounded Xin Zhui’s coffins with items relevant to every aspect of the lady’s life. The first compartment was a dining room, complete with cushions, an armrest and the Xin Zhui’s stick. Meanwhile, on a low Han dining table, a lavish feast was laid out consisting of meat and vegetable dishes, flavoured with spices and accompanied by savoury condiments and finished off with rice cakes. Other compartments contained lady Dai’s personal effects. Attendants had packed the tomb with her clothes, including an exquisite gold silk dress, embroidered with flowers and phoenix’s and the lady’s fingerless gloves, her cosmetic boxes and musical instruments. Amongst the food supplies that Xin Zhui was taking into the afterlife were medicinal supplies- including a beverage designed to bestow long life and health made from caterpillar fungus. At the centre of the tomb was Lady Dai’s nest of four lacquered coffins, surrounded by 162 wooden carvings of her mourning servants. The outermost coffin was draped with a T shaped silk banner proclaiming Lady Dai’s identity and status in the afterlife. Its depiction of lady Dai herself is the earliest example of a portrait of a known individual from China. As for Lady Dai’s body, that lay in the innermost coffin, cocooned in twenty layers of silk cloth tied with ribbons and covered with more charcoal and white clay.